You’d have a tired bottom, too, if yours were 127 years old. 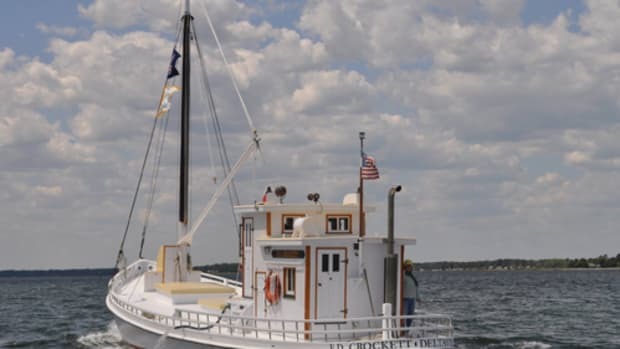 That’s the case with the Edna E. Lockwood, an historic, log-bottom Chesapeake Bay sailing bugeye that’s getting a new lease on life at the Chesapeake Bay Maritime Museum in St. Michaels, Maryland. More than two years after a search for the perfect loblolly pine lumber to rebuild her began, the graceful old girl is up on the hard only miles away from where she was originally built and launched. During the next two years, she’ll be given a refit to restore her to as precise a condition as when she first sailed Chesapeake Bay — down to the inch, with the help of laser scanning. The Edna E. Lockwood was launched Oct. 5, 1889, at Tilghman Island, Maryland, built by John B. Harrison for Daniel W. Haddaway to dredge the Chesapeake for oysters. She was designed and built as a bugeye — a powerful, twin-masted oystering sailboat with wide decks, shallow draft, a centerboard and low freeboard. Perhaps most unique about Edna E. Lockwood is her construction. Instead of utilizing traditional plank-and-frame construction throughout, her bottom was chunked away from nine lengthy pine logs. The logs were shaped using adzes and axes, then pinned together to form the bugeye’s bottom. Sawn lumber was difficult to obtain at the time, so builders often used this “log bottom” method instead of relying on milled lumber. More traditional plank-and-frame techniques were employed to build her topsides and decks. 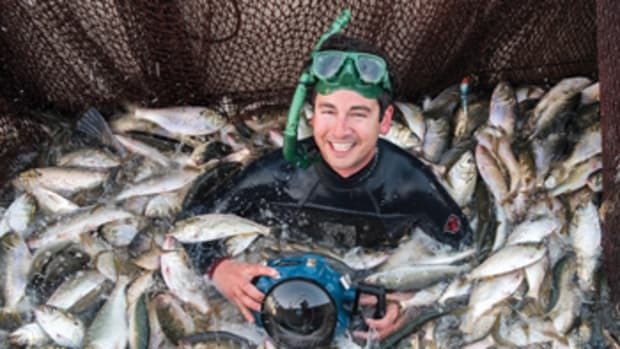 She has a 17-foot, 2-inch beam, a shallow draft of around 2½ feet and a length overall of 54 feet, 8 inches. 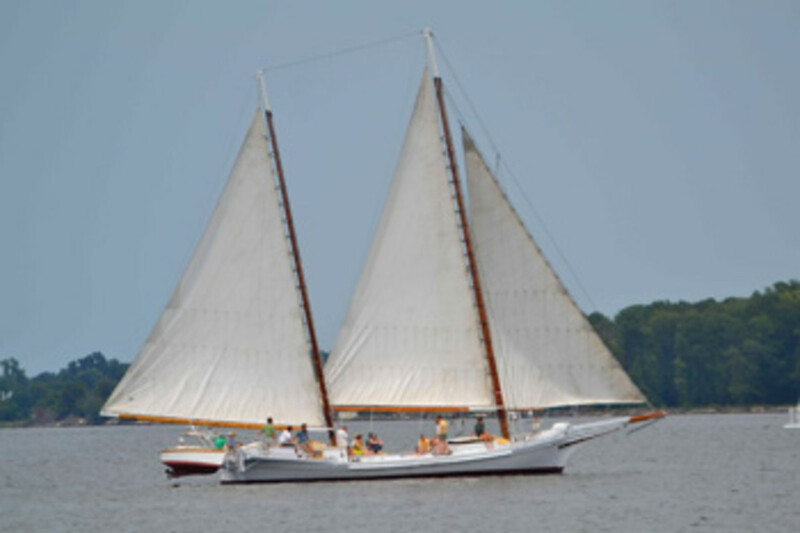 Edna E. Lockwood’s powerful sail plan was designed to allow her to tow a pair of heavy metal dredges to pull oysters off the bottom of the Chesapeake. Her wide beam let her carry a robust sail plan yet remain stable, while her relatively shallow draft allowed her to operate over oyster bars in skinny water. Indigenous to Chesapeake Bay — and ultimately an evolution of the Native American dugout canoe — log-bottom bugeyes such as the Edna E. Lockwood were at the apex of their popularity during the late 1800s, when the Bay experienced an oyster boom. 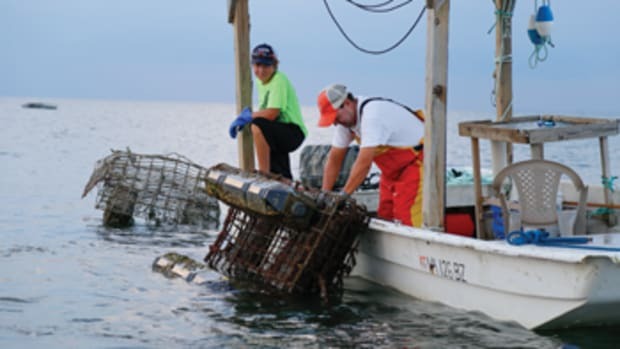 But by the turn of the century, the oyster fishery was in decline, and skipjacks — smaller, less-expensive, single-masted sailing dredge boats — became the vessel of choice among oystering watermen. 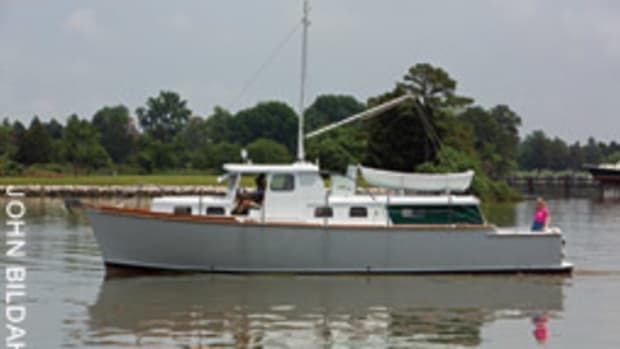 Despite most craft of her type being designed to last only 20 years, Edna E. Lockwood continued working oyster beds for 78 years and was the last log-bottom bugeye to ply the Chesapeake. 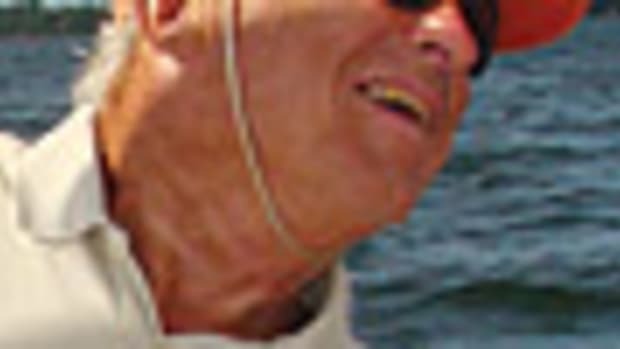 She eventually hung up her oystering dredges for good and was purchased for use as a pleasure craft in the early 1970s. In 1973, her owner donated her to Chesapeake Bay Maritime Museum, and in 1975 she was stripped to the waterline, and her topsides and deck were completely rebuilt. By 1994 she’d been designated a National Historic Landmark. Forty years after her topside and deck restoration, the Edna E. Lockwood is the last remaining log-bottom bugeye on the Bay, still able to sail on her original bottom, which has been patched, improved and maintained during the past four decades. About five years ago, however, shipwrights discovered that metal sickness had nearly ruined many of her original logs. Much of the patchwork was beginning to fail. Planning began in earnest to restore Edna E. Lockwood’s log bottom in a historically accurate fashion. It turned out that planning the restoration was among the easiest parts of the job. The National Park Service laser-scanned and photographed the Edna E. Lockwood’s structure, providing accurate digital plans showing the shape and size of the logs that would be needed to make the restoration true to the bugeye’s original measurements. Then the museum started looking for the logs to get the job done — a task that turned out to be more difficult than you’d expect. Shipwrights determined that the bottom required at least 12 pine logs of varying lengths and circumferences, but they needed to be an average of 55 feet long and 10 feet in circumference. Back in 1889, when Edna E. Lockwood was built, finding loblolly pine trees of these dimensions was a relatively easy task. Today, with much of the older-growth tree stands gone, finding logs this size proved a challenge. It took the museum nearly two years to locate the right trees. Eastern Shore. Based on their rings, the trees range in age from 129 to 147 years. Twelve of the pines, all of which had recently been felled by the Paul M. Jones Lumber Co., were donated to the museum. They were so heavy that only three or four could be trucked at a time. By early October, the work had begun. Edna E. Lockwood was hauled and blocked, and most of the logs for her bottom were on land. 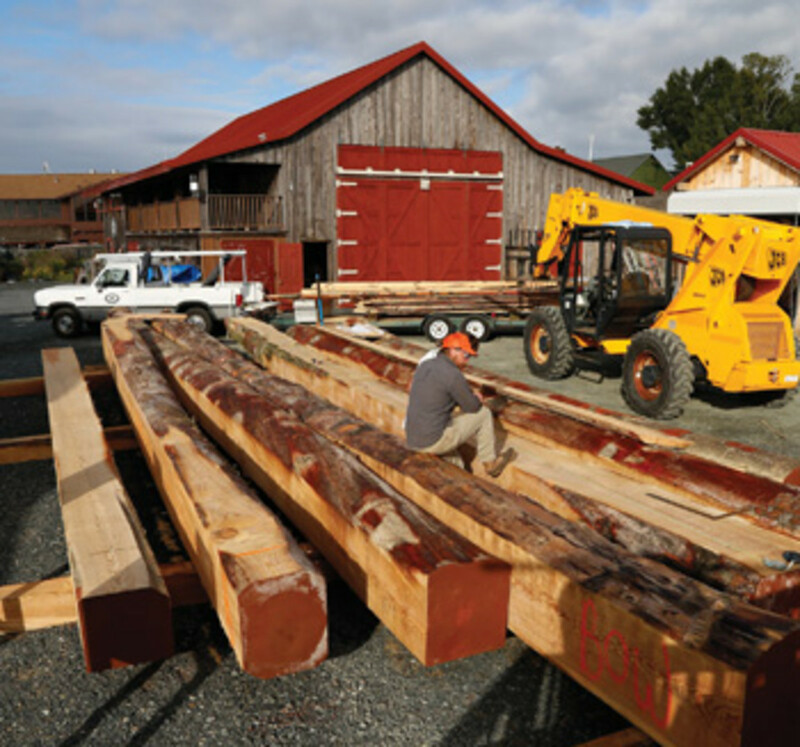 A 70-foot-long, railway-length saw mill was onsite to shave them into manageable shapes. With a pleasant scent of pine wafting about the yard, shipwrights carefully used the National Park Service plans to sketch out where shaping cuts would be made on the logs. Nine logs will make up the basic bottom structure, while the others will be used as fillers to round out the hull’s graceful shape. 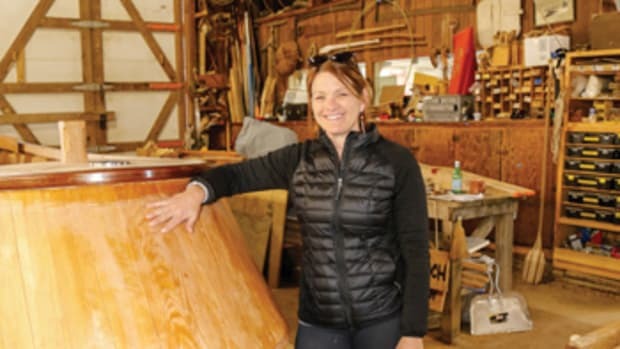 Three full-time shipwrights and three apprentices will continue to work on the bugeye through the winter, with the goal of having her log bottom pinned together by spring, weather permitting. Stay tuned. You can keep up on the project’s progress by visiting ednalockwood.org/progress.